L.A. Dreamin'® Hydrangea is one of the most impressive big leaf hydrangeas we've seen. It produces pink, blue and lavender blooms all on one plant, regardless of your soil's pH. 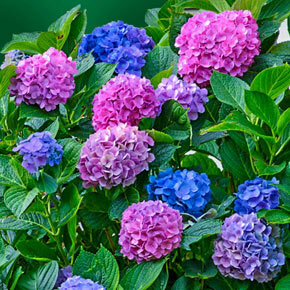 You no longer have to worry about supplementing your soil to achieve a certain hydrangea color. You'll just delight in the color show as it blooms and blooms again from early summer until fall. Its large flower heads are borne on sturdy, upright stems, and they rebloom strongly, flowering heavily on both old and new wood; this means you will have an abundant show from early summer through hard frost. Plant in humusy soil, ideally in a spot that gets morning sun and a little afternoon shade. This variety holds up better in heat than older ones, but it benefits from extra water when first planted. Named in honor of the breeder's daughter. 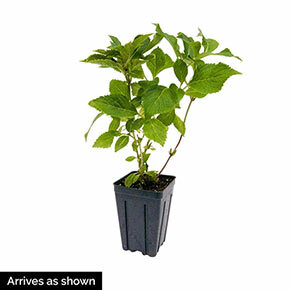 This outstanding new Big Leaf Hydrangea grows a compact 4' tall and wide, a nice size for most any garden. It's impressive when planted near entryways, along walkways or as a focal point. The flower heads make striking fresh bouquets and can be dried for year-round enjoyment. 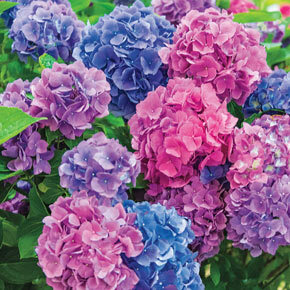 Hydrangea 'Lindsey Anne' PPAF.